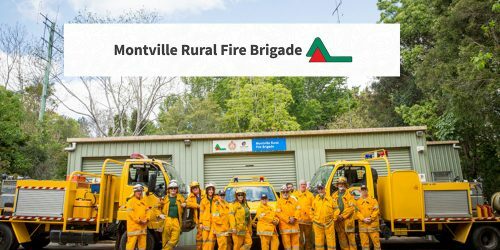 Greetings, from Montville Rural Fire Brigade. First up, I would like to thank the editor for giving me more time to get this article written. Through one thing or another I have been very busy and extremely time poor in recent months. We recently completed a large hazard reduction burn on Palmwoods/Montville road and if the weather will play ball, we have one small burn on the same road to do. This will then complete our prescribed burn plan for this year. As I write this, because I am late doing so, I have only recorded 11 mm of rain from Saturday the 25th to Sunday the 26th of August, which isn’t enough to slow the fire season. There is no decent rain forecast for the immediate future and the longer outlook is for less rain. This is where I want to remind people to clean up around their homes, because as it stands now we are in for a long fire season. The Rural Fire Service has already sent many Strike teams away to help other areas, and mainly to the South Burnett area. I would like to mention our Facebook page. One of the main reasons for setting it up is to get information out to the community we live in. This information may be general in nature but it could also be important information, that you need to receive quickly. We would endeavour to get the important information posted in a timely manner, but that would depend greatly on how busy we are or the type of incident that is emerging. So please check out our Facebook page, with the below link, then like and share. That way you will be kept as up to date as possible, when information is posted. If anyone is interested in joining the brigade, please use one of the following contacts. Our Fire Warden is John Watson and his number is 0477712175. All the best and stay safe from Montville RFB.